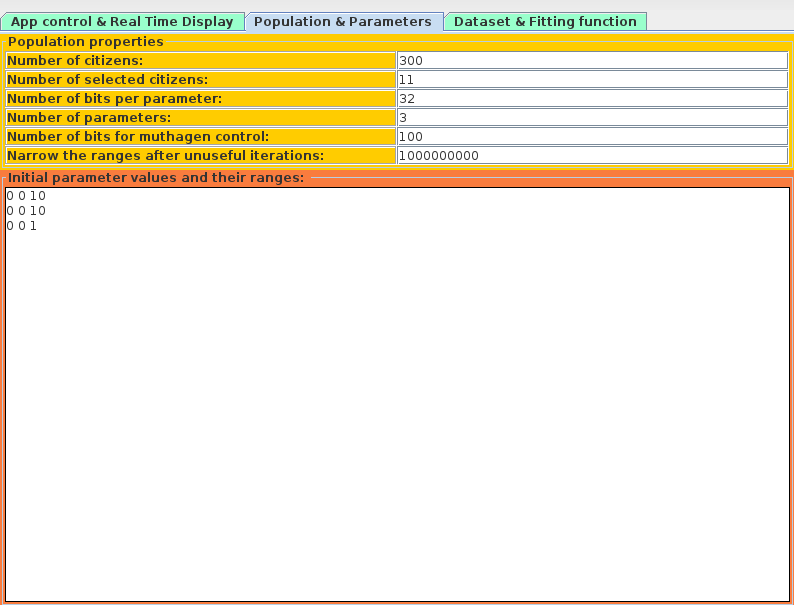 The window of the application is divided into three tabs: "App control & Real Time Display", "Population & Parameters" and "Dataset & Fitting function". The second one allow to set some important parameters, let see which they are and what they perform. Number of citizens: This parameter allow to set how many inidividuals are created at each step. Number of selected citizens: This allow to set how many individuals have to be kept for the new generation. Number of bits per parameter: This allow to set how many bits are used for each parameters of the function, more bits means more precision but less speed, for optimization reasons it is best to use only the values "32" or "64" here. Number of bits for muthagen control: This allow to set the number of bits that are changed randomly on the current generation of individuals, is like some muthagen agent that act on the indidivudals at the moment they are generated. Is useful to allow the algorithm to make small modifications on the best individuals and see what happen. Narrow the ranges after unuseful iteration: This allow to set how many iteration can occur before the ranges of the parameters are halved. After this number of iterations is reached, the ranges of the parameters are halved keeping as center of the range the current best parameter and the computation restart from there. Initial parameters vlaue and parameters range: This allow the user to set parameters ranges and initial parameters values, each row contains "intial value", "min value" and "max value" in this order, for each parameter present into the function. Each value must be space-separated.